Wake up with well-rested skin! Certified organic* METEO LOGIC Moisturizing Night Cream meets the skins essential needs: it has a profound moisturizing effect, it protects skin cells from the negative effects of free radicals and prevents skin ageing thanks to Alga-Gorria®, our patented powerful antioxidant. Furthermore it specifically stimulates physiological processes that take place in the skin at night: the intensification of epidermal cellular renewal and the reduction of skin reactivity, for well-rested skin. Tests prove an intense moisturizing effect: +35% after 8 hours, +18% after 24 hours (% improvement of moisture content in the superficial layers of the epidermis, after a single application as compared to control, tested by corneometry). Our Night Cream is most effective when used in combination with the other METEO LOGIC skincare products. "My skin is so much better moisturized since I started using it. Smells great. One pump is enough!" 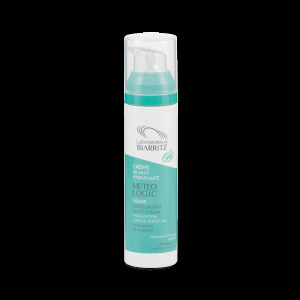 METEO LOGIC Night Cream plunges skin into a moisturizing bath all night long. Specific active ingredients stimulate processes that naturally take place during the night: intensifying epidermal cellular renewal and reducing skin reactivity for a real "facelifting" effect! On awakening, the skin is regenerated, soothed, pulped, traits are smoothed, and signs of tiredness disappear.